As the only non-meat-eating member of my family, I bring a batch of this with me to every Thanksgiving dinner. 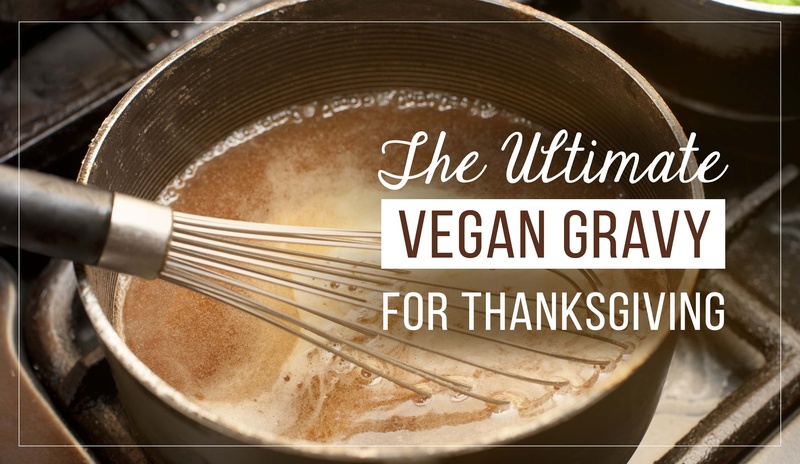 It's so delicious that there's always a handful of people (meat eaters) who choose this gravy over the standard meat-based version. It's quick, easy, and uses ingredients you probably already have in your kitchen. You can add a little fresh sage, thyme and/or rosemary for an extra boost of holiday flavor. Enjoy! Put coconut oil in a saucepan and sauté the onions and garlic over med-high heat. Reduce heat back to medium after onions and garlic have become golden brown. Still stirring, add Tamari or Bragg’s Aminos and water to the mixture. Once the gravy has reached desired thickness, turn off the stove and you are done! Put 4 oz of sliced mushrooms in a small sauté pan along with 1 tsp Barlean’s Butter Flavored Coconut Oil. Sauté over low-medium heat until golden brown. Stir finished mushrooms slowly into the gravy.